Raj Sahulee, D.O., et al. A Standardized Postoperative Handover Protocol Improves Inter-Provider Communication after Pediatric Cardiac Surgery. (2016) J Heart Cardiol 2(1): 6-11. © 2016 Raj Sahulee, D.O. This is an Open access article distributed under the terms of Creative Commons Attribution 4.0 International License. Objective: To determine if a standardized handover protocol from the operating room to the pediatric cardiac intensive care unit would be associated with an objective improvement in communication between care teams. In addition, if the protocol would be associated with improved subjective assessment with handoff, as well as provider satisfaction with the process. Methods: In phase 1, an assessment of 20 patient handovers from the cardiac operating room to the pediatric cardiac intensive care unit at Kravis Children’s Hospital was obtained by direct observation. A checklist of 23 key elements of patient transfer recorded patient identification, procedure information, anesthesia details, patient status and the duration of handoff. Later a survey was created to evaluate care team provider’s assessment of the information transferred during handoff, and their satisfaction with the process. Next a multidisciplinary team developed a 4 step standardized handover protocol. In phase 2, another 20 patient handovers were observed, and the provider survey was repeated. Measurements and Main Results: A total of 40 observations of patient handover were performed during the study. In phase 1, 69.3% of key handoff elements were transferred as compared to 81.3% in phase 2 (p = 0.003). The duration of the handoff was not significantly different between phases (7.85 min vs. 8.35 min; p = 0.69). There was a significant improvement in provider assessment of information transfer (6.58 vs. 7.58 mean modified Likert score; p = 0.003). There was a non-significant trend towards increased provider satisfaction with the handover process (6.26 vs. 6.85 mean modified Likert score; p = 0.33). Conclusions: In this study, a standardized handoff protocol was associated with objective and subjective improvements in communication between care teams without increasing the duration of handoff. The transfer of care between providers is a vulnerable time for critically ill children, especially those who have undergone cardiac surgery. This period is characterized by the presence of multiple providers, disruption in the monitoring of hemodynamics, transition of life sustaining devices and medications, and represents a time where clear communication is imperative. Previous studies have shown that inadequate communication during this crucial time has been associated with medical errors and adverse events[1-4]. Standardized handoff protocols from the Operating Room (OR) to the Cardiac Intensive Care Unit (CICU) have been shown to reduce communication errors and promote team efficiency[5-7]. In fact, in 2006, the Joint Commission recognized the importance of handoff communication in ensuring patient safety and designated improvement in patient handoff a National Patient Safety Goal. With the decline of perioperative mortality, many cardiothoracic programs have devised measures to reduce harm for their patients throughout the hospital course. In addition to improving communication, standardized handoff protocols from the OR to the CICU have been associated with improved patient outcomes beyond the immediate postoperative period. Specifically, Kaufman et al has shown that a handoff tool was associated with shorter ventilator times, intensive care unit time and length of stay. While several handoff studies have investigated communication pitfalls associated with patient handover, few pediatric studies have examined the process of handoff objectively while simultaneously assessing the subjective perceptions of the providers implementing them. Therefore the primary aim of this study was to determine if the introduction of a standardized postoperative handover protocol would be associated with improvements in objective and subjective assessments of information transfer between OR and CICU providers after pediatric cardiac surgery. Our secondary aims were to determine if a standardized protocol would improve provider satisfaction with handoff process, or affect the duration of handover between care teams. This was a prospective interventional study with direct observation of handover performance conducted in the CICU at Kravis Children’s Hospital at the Icahn School of Medicine at Mount Sinai. As a primary quality improvement initiative, the pediatric quality improvement and safety committee reviewed the proposal and waived the need for institutional review board approval. The study was performed in 2 phases over approximately 15 months. In phase 1 of the study, we evaluated the handover process that was previously in place at our institution for the handoff of patients from the OR to the CICU from several perspectives. First, 20 patient handoffs after pediatric cardiothoracic surgery were directly recorded from a single non-participating observer (RS). A checklist was used to assess essential elements of patient handover between the OR team and the receiving CICU providers. The checklist recorded handover elements such as the presence of necessary personnel and equipment, tracked the content of information transferred between providers, and timed the duration of handoff. Specifically, the checklist recorded the information transferred between teams including patient identifiers and demographics, anesthesia details, surgical details and bypass information, blood products given, current medication infusions and dosages, and problems encountered during the case such as ventilation issues, excessive bleeding, and dysrhythmias. The participating care team members were blinded to the metrics being collected. After 20 handoffs were observed, a survey developed by the principle investigators was sent to all members of the care team involved in the handover receiving process. For the purposes of this study, the care team providers were defined as the pediatric cardiology fellows, physician assistants and CICU nurses. In the anonymous survey, members of the care team provided their subjective assessment of the frequency that all key personnel were present and that pertinent information was transmitted during patient handover. Responders used a modified 10-point Likert scale to assess the frequency that information such as patient details, preoperative details, anesthesia details, surgical details, and patient status details were transferred between teams during handoff. Finally care team providers were asked to rate their personal satisfaction with the handover process as it relates to understanding the information transferred, ability to perform their specific roles, and absence of distractions during patient handoff. In preparation for phase 2 of the study, we developed a 4 step standardized postoperative handover protocol with multidisciplinary input from the divisions of Pediatric Cardiothoracic Surgery, Pediatric Cardiac Anesthesia, Pediatric Cardiology, and Pediatric Critical Care (Figure 1). In step 0 (Preparation), patient information was communicated by telephone using a previously established handoff from the OR circulating nurse to the CICU bedside nurse > 30 minutes prior to departure from the OR to the CICU to help prepare the accepting team for any devices, medications, or additional equipment that would need to be ready at time of patient receipt. In step 1 (Physical Handover), following the arrival of the patient in the CICU, the anesthesia team, bedside nurses and respiratory therapists physically transferred respiratory support, medications, drains and monitors, while other members of the CICU team performed visual assessment of the patient from a distance to prevent physical obstruction to workflow. In step 2 (Verbal Handover), with all attending physicians present, face to face verbal handoff was performed using a standardized handoff script. Highlights of the script included essential patient identification elements, pre-operative details, surgical details, anesthesia details, post-operative status and recommendations for further management. At the conclusion of the verbal handoff, all members of the CICU care team were able to ask questions, or for clarification if necessary. In step 3 (Care Plan), the patient was physically assessed by the CICU providers, and an individualized care plan was developed for the patient by the cardiology fellow and relayed to the other members of the CICU team. Closed loop communication was demonstrated by the repeat of the specifics of the care plan from the bedside nurse to the rest of the team. Protocol training of the clinical team members took place with in-service training sessions, as well as reinforced over the period of 1 month prior to all new surgical admissions. During this time input was gathered from all team members to assess for any common problems. Once feedback was received, the handover protocol was refined and was put into place for every subsequent handoff from the OR to the CICU. Phase 2 of the study began 1 month after the implementation of the standardized postoperative handover protocol. First, another 20 patient handovers were directly observed between the OR and CICU teams. The same checklist from phase 1 was used to assess for essential elements of patient handover as well as timed the handoff process. Finally, the care team survey was repeated to get the providers subjective assessment of information transfer at the time of patient handoff between teams. That survey concluded with the provider’s satisfaction with regards to the handover process after protocol implementation. The data from the handoff observations and provider surveys from both phases of the study were collected and evaluated. All data was entered and analyzed on SPSS version 20. 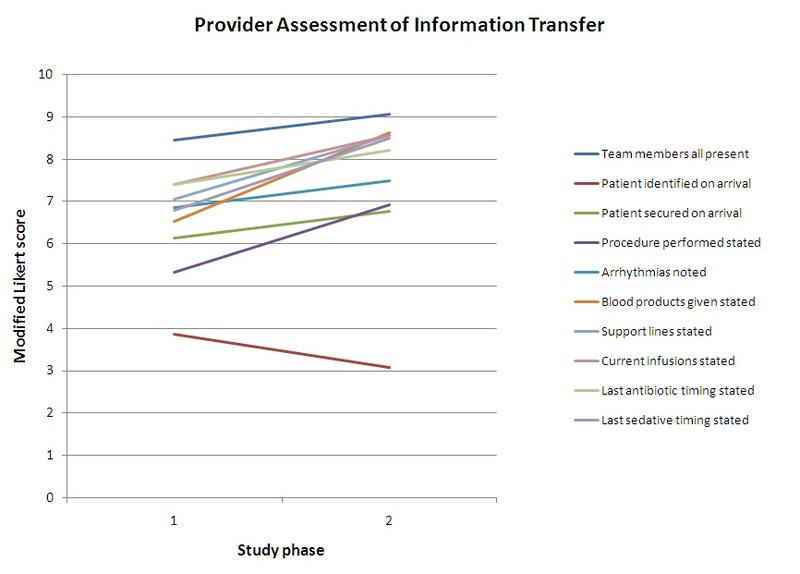 Objective data such as essential handover elements transferred and duration of handoff were compared, and subjective elements such as provider perception of information transfer and provider satisfaction were analyzed using paired and unpaired t-tests. A p-value of < 0.05 was considered significant. 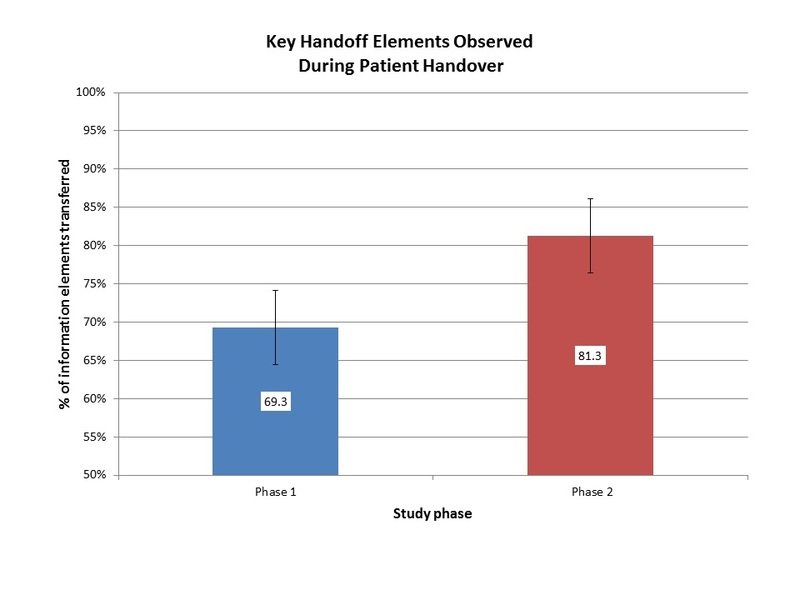 Essential elements of patient handover were present in 69.3% of handoffs in phase 1 of the study. After protocol implementation in phase 2, 81.3% of essential elements were observed to be transferred between care teams: a significant increase (p = 0.003; Figure 2). Comprehensive patient identification and demographics were the elements most frequently omitted during handoff in both phases of the study. The duration of patient handover did not significantly change between phase 1 and phase 2 of the study (7.85 vs. 8.35 min, p = 0.69; Figure 3). The survey was completed by all CICU providers (18 in phase1, 17 in phase 2), however some of the providers changed during the study period (nurses and fellows). 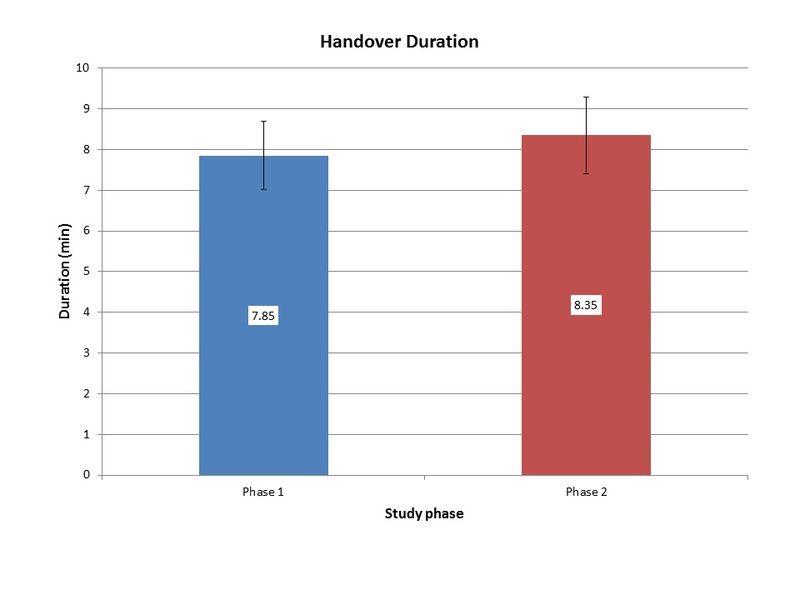 Provider perception of information transfer during handoff significantly improved (6.56 - 7.58, p = 0.003; Figure 4) between study phases. There was a non-significant improvement in provider satisfaction with the handover process among all CICU providers (6.26 vs. 6.85, p = 0.33; Figures 5) but this differed between the types of healthcare providers. Our study suggests that a standardized handover protocol for the transfer of children from the OR to the CICU is associated with objective and subjective improvements in information transfer, without significantly increasing the duration of handoff. A multidisciplinary team approach to post-operative care for cardiac surgical patients necessitates high quality communication during handovers. Prior to protocol implementation, there was a 31% loss of transfer information during verbal handover, a figure similar to that reported in other studies[1,10] . Our 4 step standardized handover protocol with the handoff script was associated with a significant reduction in the omission of critical information during patient transfer. We also believe the avoidance of distractions and reduction of unnecessary provider conversations improved the capture of critical information among the members of receiving team. This improvement is encouraging as there is data suggesting that 82% of root-cause analysis performed cited communication failure as at least one of the factors in an adverse event or close-call reports. Surprisingly, comprehensive patient identification and demographics remained frequently omitted despite inclusion in the handoff script. The importance of this step has been re-emphasized at our institution since the conclusion of this study. The introduction of the standardized 4 step handover protocol resulted in more successful communication from the OR team to the CICU team at each step. In the first step of our handover protocol, information was transmitted from the OR to the CICU prior to the arrival of the patient in the unit facilitating communication about the procedure, complications, and equipment that may needed. As a result the entire multidisciplinary team could anticipate the needs of the patient, and be ready and waiting to receive a critically ill child. This potentially avoided any reduction in the level of acute care between patient locations. In the second step, the patient was physically transferred into their bedside position with uninterrupted transfer of life sustaining devices and monitors, without obstruction or distraction from team members that were not essential at that specific moment of patient care. Non-essential personnel were positioned in a manner not to impede workflow of the anesthesiologists, respiratory therapists and bedside nurses as described by Catchpole et al and taken from a Formula-1 pit-stop model. Without obstructing workflow, these members of the CICU team participated in active observation of the patient and began their clinical assessment of the patient’s condition as this physical handover was occurring by the nurses, anesthesiologists and respiratory therapists. In theory, this lack of obstruction would help improve care teams ability to perform their necessary tasks without interruption, and potentially reduce the time needed for handover. In the third step of the handover protocol, only when the entire multidisciplinary team was ready, was verbal handover delivered using the standardized script. Starting with patient identification measures, the anesthesiologist provided anesthesia details, surgical details and current patient status and their recommendations for further management. At the completion of the verbal handover by the anesthesiologists, any member of the receiving team had the opportunity to ask clarifying questions or ask for key information that may have been omitted. This step is designed to help verify that the information between teams was transmitted accurately and without omission. 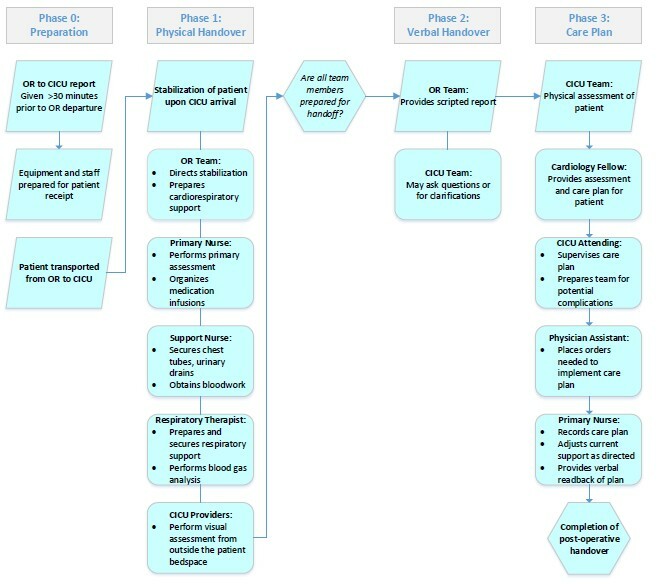 Finally, in the fourth step of the handover protocol, the care team created a formal care plan for the patient as led by the cardiology fellow and supervised by the attending physicians. The plan was created along with the physician assistant and bedside nurse, allowing the physician assistant to enter all necessary orders and the bedside nurse was able to record all the details of the care plan. Finally, closed loop communication was demonstrated when the bedside nurse performed a read back of the care plan, thus demonstrating an understanding of the plan for the patient. This 4 step protocol improved the overall quality of communication, both the transfer of information between the OR to the CICU teams, as well as among CICU providers themselves. Studies have shown that a formalized communication process can reduce gaps in patient care, and importantly avoids a shift in goals and plans between care teams[12,13]. Previous studies have evaluated the introduction of a standardized handover process of pediatric cardiac surgical patients before, but only for a limited number of patients and time periods[3,6,7,9,10], however very few have investigated the perceptions of the providers participating in the process. We designed a study that would both objectively and subjectively assess patient handover. We initiated a multidisciplinary approach to improve communication, but we still rely on active participation by all members of the OR and CICU teams to be successful. Prior to initiation of the standardized handover protocol we provided a 1 month in-servicing period for the entire clinical team of attending anesthesiologists, intensivists, cardiac intensivists, nurses, cardiology fellows and physician assistants. However due to the rotating nature of the anesthesiology team, the anesthesia residents and fellows who participated in the handover protocol were not in-serviced on physical and verbal handoff in step 1 and 2 of our protocol. The increase from 69% to 81% of reported elements could likely have been further improved if the anesthesiology trainees were also in-serviced on the importance of the structure and content of the verbal handoff, especially with regards to patient identification and demographics. It is also possible that the physical transfer of the patient would have been more efficient, thus potentially leading to no change or even a reduction in handoff duration. However, this hypothesis remains speculative at this point. This study has several inherent limitations based on its design. Our primary aims were to objectively and subjectively assess and improve inter-provider communication, and thus patient outcomes were not investigated. Therefore our study cannot directly associate the observed improvements in communication with changes in patient outcome. Fortunately, a few pediatric studies have demonstrated the association with improved handoff with improved patient outcomes, specifically length of mechanical ventilation, CICU time and hospital length of stay[9,10]. We were also unable to perform paired analysis in study phases because our surveys were de-identified, and there was also a minor change in personnel, possibly influencing the results of our subjective data. Finally it should be noted that due to their rotating nature, the anesthesia team did not participate in the survey, so it is possible the structure and time needed for preparation of handoff would have potentially influenced their satisfaction with the handover process. Since the conclusion of the study, ongoing reinforcement of the structure of handoff, and its implications for improved communication for all members of the care team, has been maintained for subsequent patients. We believe that as increasing familiarity and comfort with the protocol improves, the efficiency, accuracy, and hopefully provider satisfaction of the handoff process will continue to improve as well. In summary, we conclude that the implementation of a standardized handover protocol for postoperative pediatric cardiac patients is associated with improved subjective and objective assessment of information transfer. The improved communication between teams did not increase the duration of handoff while non-significantly improving provider satisfaction with the handoff process. We believe that additional studies will further strengthen the belief that systems of practice that improve communication and reduce variation between providers will eventually lead to more consistent and thus superior patient outcomes. The authors would like to acknowledge doctors Khanh Nguyen, Alexander Mittnacht, Ingrid Hollinger, and Cecilia Thompson in the development of the handover protocol and care team survey. 1. Greenberg, C.C., Regenbogen, S.E., Studdert, D.M., et al. Patterns of communication breakdown resulting in injury to surgical patients. (2007) J Am Coll Surg 204(4): 533-540. 2. Carthey, J., de Leval, M.R., Reason, J.T. The human factor in cardiac surgery: Errors and near misses in a high technology medical domain. (2001) Ann Thorac Surg 72(1): 300-305. 3. Catchpole, K.R., de Leval, M.R., McEwan, A., et al. Patient handover from surgery to intensive care: Using Formula 1 pit-stop and aviation models to improve safety and quality. (2007) Paediatr Anaesth 17(5): 470-478. 4. Catchpole,K.R., Giddings, A.E., de Leval, M.R., et al. Identification of systems failure in successful pediatric cardiac surgery. (2006) Ergonomics 49(5-6): 567-588. 5. Craig, R., Moxey, L., Young, D., et al. Strengthening handover communication in pediatric cardiac intensive care. (2012) Paediatr Anaesth 22(4): 393-399. 6. Zavalkoff, S.R., Razack, S.I., Lavoie, J., et al. Handover after pediatric cardiac surgery: A simple tool improves information exchange. (2011) Pediatr Crit Care Med 12(3): 309-313. 7. Joy, B.F., Elliott, E., Hardy, C., et al. Standardized multidisciplinary protocol improves handover of cardiac surgery patients to the intensive care unit. (2011) Pediatr Crit Care Med 12(3): 304-308. 8. Improving America’s Hospitals. (2007) JOINTCOMMISSION Annual Report on Quality and Safety. 9. Kaufman, J., Twite, M., Barrett, C., et al. A Handoff Protocol from the Cardiovascular Operating Room to the Cardiac ICU is associated with Improvements in Care Beyond the Immediate Postoperative Period. (2013) The Joint Commission Journal on Quality and Patient Safety 39(7): 306-311. 10. Agarawal, H.S., Saville, B.R., Slayton, J.M., et al. Standardized postoperative handover process improves outcomes in the intensive care unit: A model for operational sustainability and improved team performance. (2012) Crit Care Med 40(7): 2109-2115. 12. Cook, R.I., Render, M., Woods, D.D. Gaps in the continuity of care and progress on patient safety. (2000) BMJ 320(7237): 791-794. 13. Patterson, E.S., Roth, E.M., Woods, D.D., et al. Handoff strategies in settings with high consequences for failure: Lessons for health care operations. (2004) Int J Qual Health Care 16(2): 125-132.